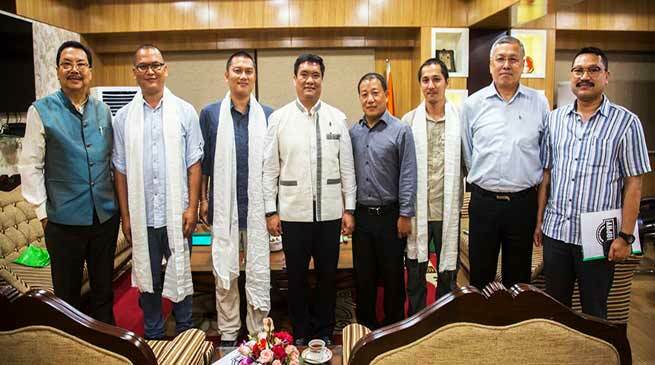 Members of the Arunachal Pradesh-based Manabhum Offroaders Club (MOC) called on Chief Minister today accompanied by Dy CM Chowna Mein, Tourism Minister Jarkar Gamlin and Namsai MLA Zingnu Namchoom. The members called on to inform about the inaugural edition of the Rainforest Trophy India (RFT), which will be held in Arunachal Pradesh from October 16-20, 2018. Slated to be biggest off-road adventure sports drive ever held in the country, the RFT challenge will be held in Manabhum forest range in Namsai district. The Chief Minister congratulated the MOC club for making their presence at the national level in the off-road motor sports. He assured all support for the upcoming RFT challenge.